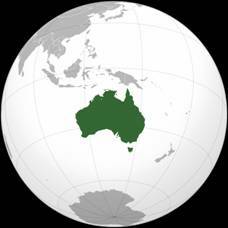 The Commonwealth of Australia is a constitutional democratic country in the southern hemisphere comprising the mainland of the world's smallest continent, the major island of Tasmania, and numerous other islands in the Indian and Pacific Oceans. It is considered as a smallest continent rather than a country which comprises of four six states and two major mainland territories. The six states are New South Wales, Queensland, South Australia, Tasmania, Victoria, and Western Australia along with Northern and Australian Capital Territory as major mainland territories. Australia has long history starting from arrival of aboriginal by boat from South East Asia during the last Ice Age, at least 50,000 years ago. Later a number of European explorers sailed the coast of Australia then known as New Holland, in the 17th century. The new outpost was put to use as a penal colony and on 26 January 1788, the First Fleet of 11 ships carrying 1,500 people – half of them convicts – arrived in Sydney Harbor. Until penal transportation ended in 1868, 160,000 men and women came to Australia as convicts. By the 1820s, many soldiers, officers and emancipated convicts had turned land they received from the government into flourishing farms. News of Australia’s cheap land and bountiful work was bringing more and more boatloads of adventurous migrants from Britain. Settlers or ‘squatters’ began to move deeper into Aboriginal territories – often with a gun - in search of pasture and water for their stock. In 1825, a party of soldiers and convicts settled in the territory of the Yuggera people, close to modern-day Brisbane. Perth was settled by English gentlemen in 1829, and 1835 a squatter sailed to Port Phillip Bay and chose the location for Melbourne. At the same time a private British company, proud to have no convict links, settled Adelaide in South Australia. Gold fever played a vital role in bringing wealth, migrants and rebellion in the hard land of Australia, which paved the way to transform Australia as destination of interest. Gold was discovered in New South Wales and central Victoria in 1851, luring thousands of young men and some adventurous young women from the colonies. They were joined by boat loads of prospectors from China and a chaotic carnival of entertainers, publicans, illicit liquor-sellers and quacks from across the world. Australia’s six states became a nation under a single constitution on 1 January 1901. One of the new national parliament’s first acts was to pass legislation, later known as the White Australia Policy, restricting migration to people of primarily European origin. This was dismantled progressively after the Second World War and today Australia is home to people from more than 200 countries. Now it turned out to be the most favored destination attracting millions of people from various quarter such as executives, students, entrepreneurs and tourist to explore this incredible and welcoming country. Australian culture was founded on the stories of battlers, bushrangers and brave soldiers, of sporting heroes, working heroes and plucky migrants. It is all about a fair go, the great outdoors and a healthy helping of irony. Today Australia also defines itself by its Aboriginal heritage, vibrant mix of cultures, innovative ideas and a thriving arts scene. Australia’s culture was greatly derived from the European lineage, but there are some distinctive Australian characteristics grown from the atmosphere, aboriginal culture and influence of its neighborhood. Since the past 50 years, the culture of Australia was strongly influenced by the American popular culture, especially movies and television. Literature, movies, opera, music, dance, painting, theater and crafts are the dynamism and creative arts of Australia, which has achieved global appreciation. The most of the immigrants are from Asian and European countries. Australia is one of the most laissez-faire capitalist economies, according to indices of economic freedom. Australia's per capita GDP is slightly higher than that of the UK, Germany, and France in terms of purchasing power parity. The country was ranked third in the United Nations 2007 Human Development Index, first in legatum’s 2008 Prosperity Index, and sixth in The Economist worldwide Quality-of-Life Index for 2005. All of Australia's major cities fare well in global comparative livability surveys, Melbourne reached 2nd place on The Economist's 2008 World's Most Livable Cities list, followed by Perth at 4th, Adelaide at 7th, and Sydney at 9th. The emphasis on exporting commodities rather than manufactures has underpinned a significant increase in Australia's terms of trade during the rise in commodity prices since the start of the century. By the end of March 2008, the GDP per capita of Australia was about $ 824.9 Billion (CIA World Fact book). The inflation rate was 4.7% per annum and 4.5% of unemployment rate in 2008. Service sector constitutes 69% of GDP, whereas agriculture and natural resources constitute 3% and 5% of GDP respectively. These statistical facts advocate that there is excellent scope for career formation in every sector. Since 1945 more than six million people from across the world have come to Australia to live. Today, more than 20 per cent of Australians are foreign born and more than 40 per cent are of mixed cultural origin. In our homes we speak 226 languages - after English, the most popular are Italian, Greek, Cantonese and Arabic. Our rich cultural diversity is reflected in our food, which embraces most of the world’s cuisines and artfully fuses quite a few of them. You’ll find European flavours, the tantalising spices of Asia, Africa and the Middle East and bush tucker from our backyard on offer everywhere from street stalls to five star restaurants. Tuck into Thai takeaway, dine out on perfect Italian pasta, do tapas in our city’s Spanish strips and feast on dumplings in Chinatown. You can also embrace our melting pot of cultures in the many colorful festivals. See samba and capoeira at Bondi’s Brazilian South American festival, dance behind the dragon parade during Chinese New Year or stroll through streets transformed into a lively piazza during the annual Italian celebrations. As a nation, we embrace a rainbow of religious belief and you’ll find Catholic and Anglican churches, Hindu, Sikh and Buddhist temples, mosques and synagogues lining our streets. Australians have a unique colloquial language, coined ‘strine’ by linguist Alastair Morrison (imagine saying Australian with your teeth gritted to keep out the flies) in 1966. This combines many long lost cockney and Irish sayings of the early convicts with words from Aboriginal languages. We often abbreviate words and then add an ‘o’ or ‘ie’ on the end as in ‘bring your cossie to the barbie this arvo’. We also like reverse nicknames, calling people with red hair ‘bluey’, saying ‘snowy’ to someone with dark hair, and tagging ‘lofty’ to someone who is small in stature. We tend to flatten our vowels and end sentences with a slightly upward inflection.